Allergroom S shampoo with Spherulites and Chitosanide is a soap free, hypo-allergenic, non-irritating emollient shampoo which gently cleanses and moisturises the skin and coat of dogs and cats. 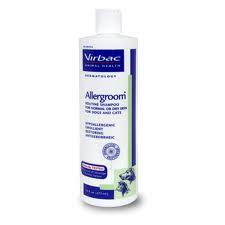 It is useful in dogs and cats with normal, sensitive and dry skin. The unique soap free formulation aids in restoring the natural lustre to the coat and facilitates grooming. Spherulites are a unique micro-encapsulation system that slowly releases the active ingredients giving a longer lasting effect. Chitosanide forms a protective barrier over the coat and skin.